No Fee to Renters (Brokers CYOF) Lease Assignment - Stabilized Lease through August 31st, 2019 with renewal option. Available on May 1st (or slightly before.) 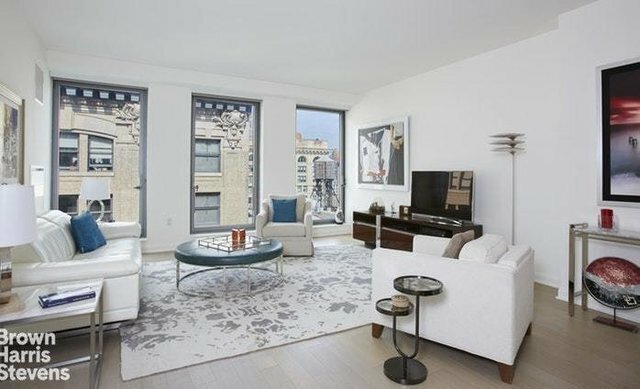 Located on West 21st Street between 5th Avenue and 6th Avenue, Apt 18C is a bright, modern 2 bedroom, 2 Bathroom apartment in a full-service new development building. This inviting, north facing apartment features a wide entry foyer and a modern pass-through kitchen. The kitchen is equipped with stainless steel GE appliances, great cabinet space, a pantry and a breakfast counter perfect for barstools. The large living and dining areas are arranged in a contemporary open layout that is ideal for entertaining. The large master bedroom has an over-sized walk-in-closet and an en suite bathroom with double sinks. The apartment is fitted with beautiful oak plank flooring and central heating and cooling is controlled by a thermostat. All windows are floor-to-ceiling and come fitted with blinds; blackout shades in the bedrooms and translucent shades in the living room. There is an in-home washer and dryer in the utility closet. Designed by Morris Adjmi Architects, 7 W 21st Street offers a full-time concierge at the front desk, a landscaped rooftop terrace, a fitness center, a resident lounge, and a game room. Located in the center of the Flatiron District, the building is steps away from multiple subway lines on 23rd Street, Madison Square Park and fine food shopping at Eatly.